Lattice QCD inputs are becoming ever more important for phenomenology. Due both to theoretical progress and the growth in available computer power, recent years have seen an enormous increase in the overall accuracy of lattice results. Examples for lattice estimates providing important constraints on phenomenological models include: form factors for semi-leptonic kaon decays, decay constants of B mesons, as well as the effective coupling constants of chiral perturbation theory. Furthermore, lattice QCD simulations have greatly contributed to determining Standard Model parameters such as the quark masses and the running coupling constant, with an overall accuracy that far exceeds the intrinsic uncertainties of other methods. The lattice community is traditionally organized into collaborations using different discretizations of the QCD action, as well as a range of algorithms and other numerical procedures, thereby producing results with different systematics. This has prompted several efforts to provide PDG-style global estimates of lattice results for use in phenomenology, including a careful assessment of systematic errors and the overall accuracy. 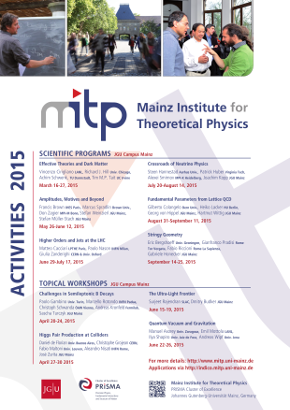 The aim of the proposed MITP scientific program is to bring together the lattice practitioners who are involved in producing global estimates with the members of the phenomenological and experimental communities who will be using lattice estimates as input for phenomenological analyses in order to test the validity of the Standard Model.